We welcome enquiries from both wine buyers and trade customers. 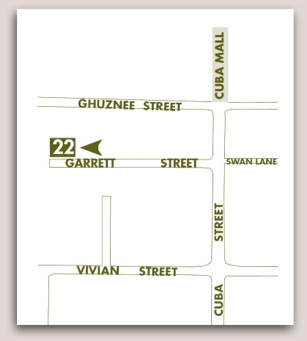 Truffle Imports is located on the third floor of the Fogel building on the right at the far end of Garrett St.
Garrett runs off upper Cuba St., between Vivian and Ghuznee Streets, as shown on the map here. There is a car park near the front door and wheelchair friendly lift access is available. Tuesday to Saturday from 10am - 4pm. We are closed Mondays, Sundays, public holidays and long weekends.